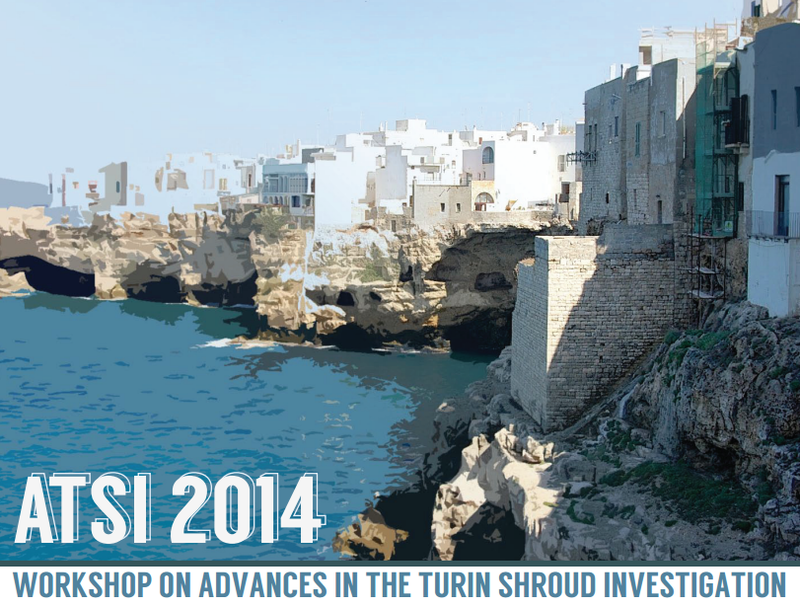 We have attended Workshop on Advances in Turin Shroud Investigation and we were surprised by the few number of persons in the room of Bari’s University where the Conference was held. Actually there were no more than 40 persons including speakers, which was later explained to us by the fact that the Conference was not opened to the general public, and we regret the absence of American and English scholars as speakers. We were disappointed by Professor Bruno Barberi’s statement that he didn’t know when Vatican would grant permission for new tests on the Shroud ( in 2012 Valencia Shroud Congress he opened the possibility of new tests in a near future although he asserted that it would be Pope’s decision). How can real advances in Shroud of Turin scientific investigation be achieved without new tests? Nevertheless there were some interesting presentations in the scientific field of image namely a new project of Shroud scanning by Professor Nello Balossino, and description of laboratory experiments by Professors Giovanna de Liso, Lattarulo, Giulio Fanti and Paolo di Lazzaro. There was also a weird presentation by Professor Valery Shalatonin from bielorussian Minsk University describing the detection of an electric field around a real size replica of the Shroud and it’s biological effects-this was indeed very interesting and a brand new issue. Outside the scientific field a new historiographical and philosophical approach about Jesus resurrection and the Shroud was presented by french philosopher and historian Professor Tristan Casabianca. The above is being shared with everyone with Maria da Glória’s kind permission. The proceedings of the conference have been distributed to attendees as a single, 137 page PDF file. I am seeking permissions or links to make this available to everyone, if that is possible. There are some fascinating papers in it. Stay tuned. Dear Dan, I am curious to read the PDF file. Yesterday I have reread an old paper by Rebecca and John Jackson : “The Jewish and Early Christian History of the Turin Shroud”. They proposed that the Shroud of Turin, besides being the possible burial cloth of Christ, also served as the tablecloth for the Lord’s Supper. because “dipping is mentioned in the Gospel” (when Jesus offers a little slice of bread, dipped into the wine, to Judas). They discovered drip patterns, adjacent to the legs of the frontal image. Considering the final drip spot at the end of a central linear pattern found at the midpoint of the Shroud, they saw that this drip spot happened to fall within the thermal discoloration zone of the 1532 fire. Also they saw that part of this spot was charred black (obviously by the 1532 fire). Is it possible to know (using Raman controls, CFM, etc.) the truth about the origin for these stains ? Are we sure that these drip patterns went into the Shroud before the body and blood images ? Where are our conjectures about useful advanced controls ? Are these controls an useless waste of time or not ? – Cheroset was a mixture of red wine, nuts and apples. >Charoset, haroset, or charoses (Hebrew: חֲרֽוֹסֶת [ḥărōset]) is a sweet, dark-colored paste made of fruits and nuts eaten at the Passover Seder. >There was also a weird presentation by Professor Valery Shalatonin from bielorussian Minsk University describing the detection of an electric field around a real size replica of the Shroud and it’s biological effects-this was indeed very interesting and a brand new issue. did not convince us on the validity of her claims. and fungus over the centuries. Where are the true proofs ? Where are the analytical proofs ? Is it possible to check the ancient linen fibrils using CFM (= Chemical Force Microscopy)? the system with the load at break). >Do you know the NEMS, the NanoElectroMechanical Systems ? the Contact resonance AFM (= CR-AFM). and frequency of the resonance modes of the cantilever are monitored. Piero, Jesus was buried with royal honours after being executed as a criminal? Where did you get that from? Jesus was not buried like Herod and Joseph of Arimathea and Nicodemus gave Jesus the most decent Jewish burial they could, given the circumstances, and that was no royal burial. Data is being gathered to write Part IV, which will be a nail in the coffin of the “Jesus family tomb” documentary/book. Regarding Bari, the scientific papers should be judged by other scientists. I don’t believe that Paolo di Lazzaro and Giulio Fanti think that they reproduced what we see in the “original”, they merely propounded the process by which the image may have been formed. A little more and we would have got the impression that it was only worthwhile listening to the “historiographical and philosophical” approach presented there. But there is no need to go to a conference just for that, one can read Larry Hurtado, Luke Timothy Johnson and Peter Kreeft at home. Thank you for your interesting answer. I hope to write something tomorrow. I beg your pardon about the question of “royal burial”. In any case I would still think with reverence for the burial of Jesus. No need to apologise, your field is science and you are good at it. I am pursuing biblical archaeology. Barrie S mentioned that STURP took a computer to Turin in 1978, but it didn’t work. That was probably the last time a computer was anywhere near the Shroud. I suspect that several of Piero’s questions and suggestions might be able to be answered at some future time with a detailed spectral analysis, possibly even at the molecular level, with the aid of modern number crunching abilities of computer analysis of the spectra. Who knows? We might even be able to detect flowers, pollen residues that escaped being vacuumed off in 2002, even perhaps wine and cheroset residues if they’re still there, although probably now degraded. Meantime we shall have to wait until such time as Vatican authorities have more confidence in scientists’ abilities and open-mindedness than they seem to have at present. Too much of the science seems to be agenda driven, regardless of what side of the authenticity divide one looks at it. The Vatican never said that they didn’t have confidence in scientists’ abilities and open-mindedness. Bishop Marcello Sanchez Sorondo, the Chancellor of the Pontifical Academy of Sciences emailed me with these words: “The opinion of the PAS is that in order to do something scientific, another test should be carried out but since the institutions that carry out these tests are rather anticlerical, the PAS currently thinks that it would not be prudent to reopen the matter until other scientific identification systems are devised.” Although not in any sense an official statement of policy, it does suggest that at present the Vatican does indeed lack confidence in scientists’ open-mindedness, if not their expertise. denied the hypothesis by Jackson. (A hybrid least squares and principal component analysis algorithm for Raman spectroscopy. Van de Sompel D, Garai E, Zavaleta C, Gambhir SS. Conf Proc IEEE Eng Med Biol Soc. 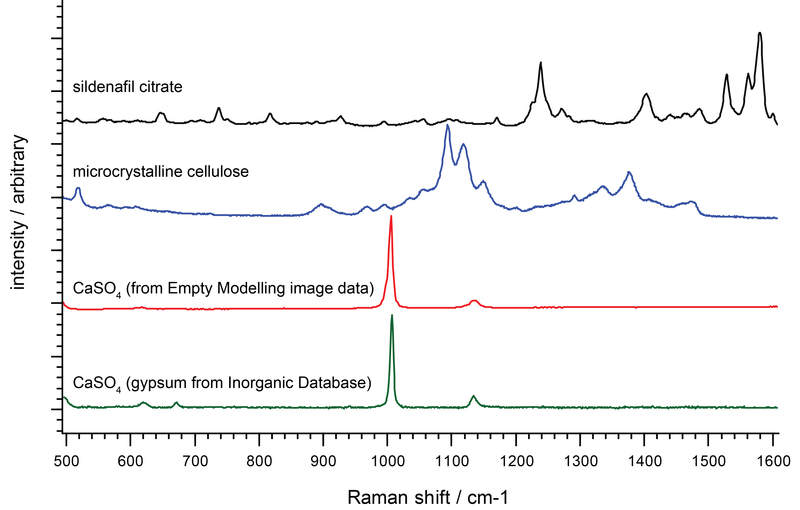 2011;2011:6971-4.
when we want to speak about Raman spectral analyses. >We graphically depict the results of our measurements as a Raman spectrum. >We plot the intensity of the scattered light (y-axis) for each energy (frequency) of light (x-axis). The frequency is traditionally measured in a unit called the wavenumber (number of waves per cm, cm-1). >We plot the x-axis frequencies relative to that of the laser as it is the shift in energy of the light that is of particular interest. As main pollens on the Shroud are from entomophilous pollination they could not have got iinto the fabric weave interstices by usual contamination. The body of the Man of The Shroud was anoited with oils and balsams, so the reason for finding entomophilous pollens like the alleged Gundelia Tournefortii which turned out to be Helichrisum was because of the body anointment. It puzzles my mind why experienced botanists like Max Frei and most importantly, israeli botanists would misidentify a kind of pollen from their own country. Dr. Marzia Boi bases this claim only on photographs, not direct examination by microscope of any remainig pollen samples. The competence and honesty of professor Danin was personally mentioned to me by a jewish speaker at Bari conference. The presence of entomophilous pollen- in this case Helichrisum not the allegedly misidentified Goundekla Tournefortii-on the fabric is allegedly justified because the body had been embalmed with an expensive Helichrisum oil. Actually you can read references to deposition of flowers beside the body in ancient jewish burial rituals- you just have to google it ,an a lot of reliable information will pop up. This practice was confirmed to me at 2012 Valencia Shroud Congress by Dr. Rebecca Jackson who is an expert in ancient jewish history and customs. So it turns out that the presence of entomophilous pollens can be easily explained by the deposition of flowers on the Shroud. Blood marks on the Shroud namely the scourge marks are very well defined and their boundaries are clear cut. If the body had not been washed and was extensively anointed with oils and balsams the bloody material would have surely spread. so it turns out scourge marks would be absolutely undefined. At least a kind of hasty washing had to be done namely life blood shed on the dorsal trunk otherwise we would see a big undefined blood stain on the cloth, not the multiple so well defined dumbell scourge marks-actually this is the proof that the body was washed, at least in some areas. These are the main reasons why we were not convinced at Valencia and this second presentation although quite well constructed did’t convince me either. More rubbish being posted on the blog. Marzia Boi is a biologist, not a palynologist, and one must be a broken record to repeat over and over again that Professor Avinoam Danin stands by Uri Baruch’s findings. For more, Prof. Litt did not publish his findings. Additional rubbish: There are complaints about just about everything that has been done in Shroud studies. It begins with STURP, then includes the conferences. You can bet that the next one will be Saint Louis. Suggestion: Why are those who are slinging mud organise a Shroud conference and present papers. One must then see if these present gospel truth. Article on the Sudarium of Oviedo What’s with the wind noise and the big stick?